A downy murrelet chick was, drawn from life through a telescope by Paul Harris Jones. Join me on a journey of discovery as I explore the secret life of the Marbled Murrelet, an endangered seabird that depends on the contested old-growth forests of the Pacific Northwest for its survival. In this work of narrative nonfiction, I trace reports of the bird back to Captain Cook’s ill-fated voyage of discovery on the Pacific Ocean in 1778, and explore the mindset of 19th and 20th-century naturalists who, despite their best efforts, failed to piece together clues about the whereabouts of the bird’s nest for 185 years. Part naturalist detective story, part environmental inquiry, this vibrant narrative follows the improbable trail from the hallowed halls of the Smithsonian Institute to the foggy coastal environs of Redwood National Park. First published in 2005, this 2013 Mountaineers Book reissue features an updated epilogue, a full index, and a list of ways you can help protect the murrelet, the oceans where it swims, and the coastal forest where it nests. Rare Bird is available online through Mountaineers Books, at brick-and-mortar indie Browsers Bookshop and Orca Books in Olympia, WA; other indie, chain, and online booksellers. To read all the reviews click here. From the moment I first encountered the marbled murrelet on the Internet in 1999, I felt compelled to learn about its strange life and tell its extraordinary story. I knew little about birds and even less about seabirds, but I couldn't resist the call of this chunky, endearing little seabird invariably described as "mysterious", "elusive", "secretive", and "endangered", and its breeding habitat as "ancient", "magnificent", and "threatened". And, I couldn't resist the call of my Muse to tell a never-before-told story. I moved my family from Virginia to California in 2001 so that I could dedicate myself fulltime to the research and writing of Rare Bird. The more I learned about this bird and the threats it faced from logging, urbanization, oil spills, and gillnet fishing made me panic. I had to help save this bird. Though the murrelet is on lists of threatened and endangered species in most of its range, the protections have yet to stabilize or recover its rapidly dwindling population. Most of what is known about the marbled murrelet is bound up in scientific journals, not in popular nature magazines or books. I wanted to share the stories of the marbled murrelet beyond the scientific community and to raise public awareness of its plight. I spent five years in the field, at libraries, seabird conferences, and at the computer researching and writing Rare Bird, which was published in hardback in 2005. In 2009, author Christopher Cokinos published a beautiful and haunting book called Hope is the Thing with Feathers, which chronicles the sad histories of five extinct birds including The great auk, a relative of the marbled murrelet. Here is the last line of the book, "I have learned much from this history and have realized, finally, that sadness at loss is our best first response. It should not be our only response. We know the world gives us life, beauty and solace. We would be ungrateful if we failed to give that back." Rare Bird is a small gesture of my profound gratitude. But gratitude and hope need to be accompanied by action. There is much to do to help this bird. 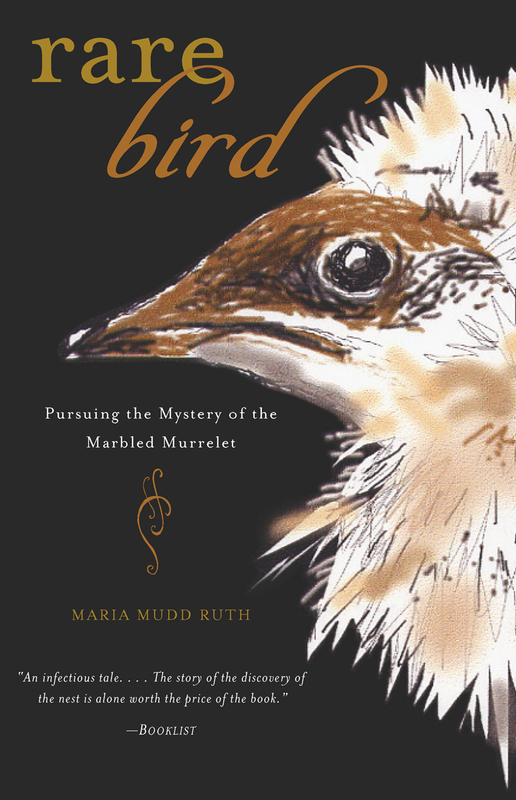 The 2013 reissue of Rare Bird by Mountaineers Books in paperback has allowed me to be a stronger advocate for conservation of the murrelet and its habitat, especially in Washington.